When you hear of East Belfast Football Club you instantly think of the red and black, Border Cup finals, or even recent events such as the clubs historic 3-0 victory against Glentoran at the Oval. This proud community club are steeped in history and success from the present day right back to the club’s establishment in 1929. However, not many first thoughts around East Belfast FC would be of Ladies football. 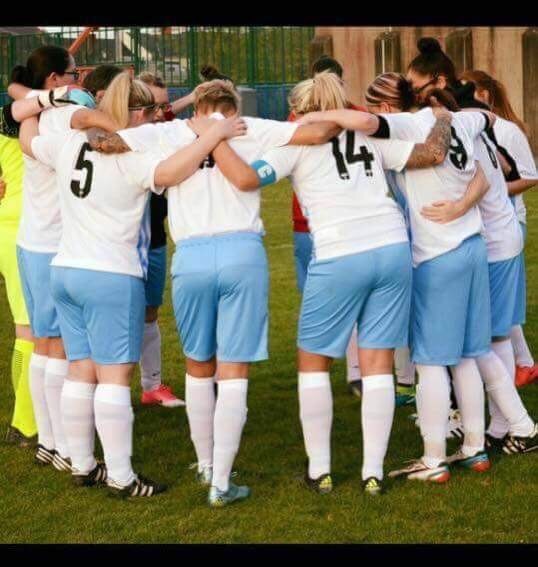 Formed 2 years ago under the guidance of John Spence, the ladies registered into the NIWFA league with the aspirations of giving footballing and social opportunities to the young females within the local community. In the short 2 years of existence the East Ladies have provided top quality coaching, fitness and nutrition advice and a sense of belonging to over 40 females aged from 16-40. Despite this success and cohesion building within the community, the ladies section have also enjoyed remarkable success on the field. In their first season the ladies won their league division on a dramatic last day showdown at Inervary Park. To back that up they appeared at Seaview stadium, in the league cup final, 5 days after the league success. They cruised to victory and lifted an impressive double in their debut season. This was an historical feat which was duly covered by BBC Newsline and numerous other media outlets. The taste of glory quickly became addictive, and the East ladies were displayed their hunger for more heading into their second season. The squad once again came back together and set their sights on creating more history. I was proud to take on the role of manager. How can you improve on what was already an incredible debut season was my initial thought? How can you grow ladies football even further in the community? Those questions were asked and answered in spectacular fashion as the East Ladies firmly stamped their name into NIWFA history. The girls became the lowest ever ranked team to reach the coveted County Antrim FA Cup final, seeing off premier league opposition along the way. No team from outside the NI Women’s Premier League had ever reached the final until the East Ladies wrote themselves into the record books of ladies football. The final was probably a step to far as Glentoran BU, loaded with International stars, took the trophy but the occasion was a taste of where this East side are heading. The league was always the main priority, the bread and butter of any teams season. And the East girls advanced through their league with ease. They not only won their league with 2 games to spare, but again created more history by becoming the first NIWFA invincibles- achieving a 100% league winning record. So 2 years, 3 trophies, 2 promotions, 2 finals and an unbeaten league run….. but we will not stop there. The East girls go again in the Championship next year. 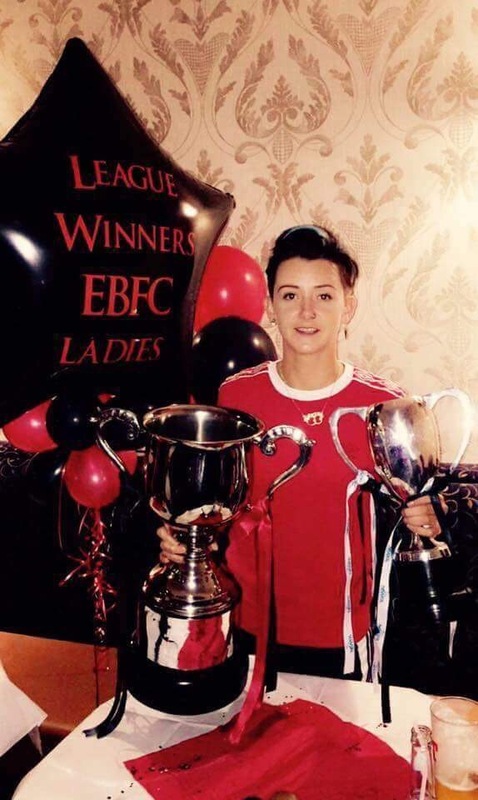 116 Responses to "SPORT: East Belfast Ladies crowned Champions again"
I used to be very happy to find this internet-site.I wished to thanks in your time for this excellent learn!! I undoubtedly enjoying every little bit of it and I have you bookmarked to take a look at new stuff you blog post. I don’t even know how I finished up right here, but I thought this submit was once great. I do not realize who you might be but definitely you’re going to a well-known blogger in the event you are not already 😉 Cheers! I don?t even know how I ended up here, but I thought this post was great. I do not know who you are but definitely you’re going to a famous blogger if you are not already 😉 Cheers! Hi! I’m at work browsing your blog from my new iphone! Just wanted to say I love reading your blog and look forward to all your posts! Carry on the excellent work! There is noticeably a bundle to understand this. I assume you have made specific nice points in features also. I love the look of your website. I recently built mine and I was looking for some design ideas and you gave me a few. May I ask you whether you developed the website by youself? Howdy! This is my first comment here so I just wanted to give a quick shout out and tell you I genuinely enjoy reading your articles. articles, except this blog offers quality based content. in my view its in fact awesome in favor of me. Useful information. Lucky me I discovered your web site by chance, and I am surprised why this coincidence did not happened in advance! I bookmarked it. You actually make it seem so easy with your presentation but I find this matter to be really something that I think I would never understand. It seems too complex and very broad for me. I am looking forward for your next post, I will try to get the hang of it! An outstanding share! I’ve just forwarded this onto a coworker who had been doing a little homework on this. I was more than happy to find this website. I need to to thank you for ones time just for this wonderful read!! have you book marked to look at new information in your web site. read a lot more, Please do keep up the great b.
It’s actually a nice and helpful piece of information. I’m glad that you shared this useful information with us. Please stay us informed like this. Thanks for sharing. I was recommended this web website by my cousin. I’m not sure whether this post is written by him as nobody else know such detailed about my difficulty. I see your point, and I totally appreciate your article. For what its worth I will tell all my friends about it, quite resourceful. Later. I have read a few good stuff here. Definitely worth bookmarking for revisiting. I surprise how much effort you put to make such a fantastic informative website. internet for more info about the issue and found most people will go along with your views on this site. care of such information a lot. I used to be looking for this particular information for a long time. my users would genuinely benefit from some of the information you present here. I’d need to verify with you here. Which is not one thing I usually do! I take pleasure in studying a publish that will make folks think. Also, thanks for permitting me to comment! With everything that seems to be building throughout this subject material, many of your points of view tend to be very refreshing. However, I appologize, because I can not give credence to your whole plan, all be it refreshing none the less. It seems to us that your remarks are generally not entirely justified and in fact you are your self not completely convinced of your assertion. In any case I did appreciate looking at it. Hey very cool website!! Man .. Beautiful .. Amazing .. I will bookmark your web site and take the feeds also…I’m happy to find a lot of useful information here in the post, we need work out more techniques in this regard, thanks for sharing. . . . . .
when I have time I will be back to read a lot more, Please do keep up the superb work. keep it sensible. I can not wait to read far more from you. Hey! Someone in my Facebook group shared this site with us so I came to check it out. I’m definitely enjoying the information. I’m bookmarking and will be tweeting this to my followers! Exceptional blog and wonderful style and design. continue your great writing, have a nice weekend! make it entertaining and you still care for to stay it wise. him as nobody else understand such special approximately my problem. of writing then you have to apply such techniques to your won blog. freedom is the best way to change, may you be rich and continue to guide others. webpage; this webpage includes remarkable and genuinely excellent data in support of visitors. on the topic of unpredicted feelings. as you wrote the book in it or something. I think that you simply can do with a few p.c. to drive the message home a little bit, however instead of that, this is great blog. this impressive informative post here at my residence. has shared this impressive article at here. made to make this actual submit incredible. Fantastic task! Very good post! We are linking to this great post on our site. beneficial in its niche. Very good blog! few pals ans additionally sharing in delicious. And naturally, thank you on your effort! Does your website have a contact page? I’m having trouble locating it but, I’d like to send you an e-mail. I’ve got some suggestions for your blog you might be interested in hearing. Either way, great site and I look forward to seeing it develop over time. It’s really a great and helpful piece of information. I am glad that you shared this useful information with us. Please keep us up to date like this. Thanks for sharing. I absolutely love your blog and find many of your post’s to be precisely what I’m looking for. can you offer guest writers to write content available for you? I wouldn’t mind composing a post or elaborating on a few of the subjects you write with regards to here. Again, awesome blog! Do you have a spam problem on this website; I also am a blogger, and I was curious about your situation; we have developed some nice practices and we are looking to swap strategies with others, please shoot me an e-mail if interested. I wish to get across my affection for your generosity supporting men and women that really need guidance on this topic. Your very own commitment to passing the solution throughout appeared to be pretty good and have without exception made employees much like me to get to their dreams. The warm and helpful guideline can mean a great deal a person like me and further more to my colleagues. Thanks a lot; from everyone of us. I wanted to type a brief word in order to express gratitude to you for those wonderful recommendations you are showing on this site. My prolonged internet research has at the end of the day been paid with sensible know-how to talk about with my neighbours. I would point out that many of us site visitors actually are unquestionably blessed to exist in a superb network with many wonderful people with great strategies. I feel truly fortunate to have seen the webpages and look forward to many more thrilling times reading here. Thank you once again for a lot of things. Currently it looks like Drupal is the top blogging platform available right now. (from what I’ve read) Is that what you’re using on your blog? F*ckin’ awesome things here. I’m very glad to see your article. Thanks a lot and i am looking forward to contact you. Will you please drop me a mail? F*ckin’ remarkable things here. I am very glad to see your post. Thanks a lot and i’m looking forward to contact you. Will you please drop me a e-mail? great post, very informative. I’m wondering why the other specialists of this sector do not notice this. You should proceed your writing. I am confident, you have a huge readers’ base already! Excellent post. I used to be checking continuously this blog and I’m impressed! Very useful information specifically the ultimate phase 🙂 I care for such information a lot. I was looking for this certain info for a very lengthy time. Thanks and good luck. Hi there would you mind stating which blog platform you’re using?I’m looking to start my own blog soon but I’m having a tough time deciding between BlogEngine/Wordpress/B2evolution and Drupal.The reason I ask is because your design and style seems different then most blogs and I’m looking for something unique.P.S Apologies for being off-topic but I had toask! Thanks a lot for sharing this with all people you actually know what you are talking approximately! Bookmarked. Please additionally talk over with my website =). We could have a link exchange contract among us! What’s Happening i am new to this, I stumbled upon this I have found It absolutely helpful and it has helped me out loads. I hope to contribute & assist other users like its helped me. Great job. Great web site. Lots of helpful information here. I’m sending it to some buddies ans also sharing in delicious. And of course, thank you in your sweat! Hello there, You’ve performed a fantastic job. I’ll definitely digg it and individually recommend to my friends. I am confident they will be benefited from this website. more people ought to look at this and understand this side of your story. Wow! Finally I got a weblog from where I know how to genuinely take useful information concerning my study and knowledge. Hello.This article was extremely interesting, particularly since I was looking for thoughts on this matter last Friday. piece of writing gives good understanding yet. Someone necessarily assist to make seriously posts I’d state. this actual publish amazing. Great task! sure if this is a formatting issue or something to do with internet browser compatibility but I thought I’d post to let you know. These are really wonderful ideas in about blogging. You have touched some good points here. almost all significant infos. I would like to see extra posts like this .